Recently we decide to do some more light experiments and came up with something that uses the same principle the Camera Projector on a larger scale. However, unlike the Camera Projector it is designed to allow you to draw the image created by the camera. 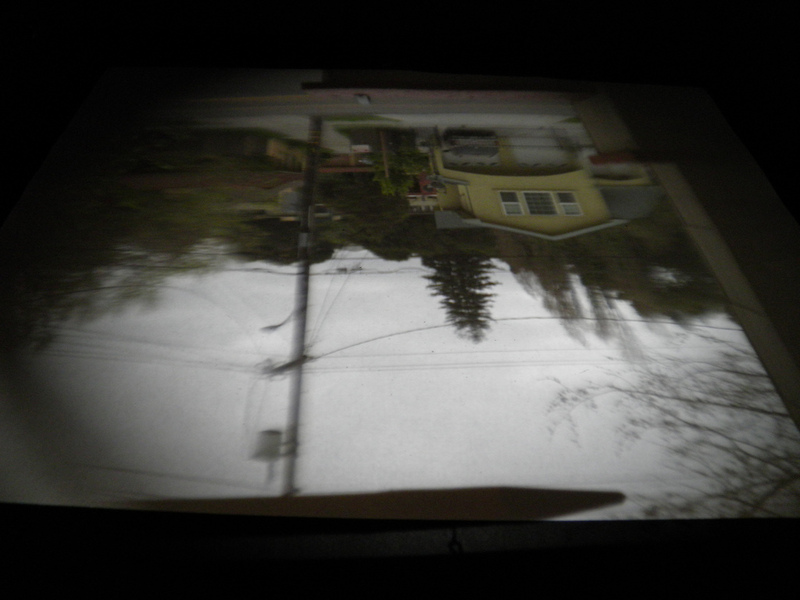 While not practical to make with students it is intriguing demonstration piece that more clearly illustrates its optical mechanics than the smaller camera projector, and it allows you to create photo realistic drawings by tracing the image. 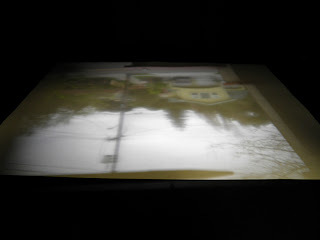 The optical system is basically a overhead projector backwards . Instead of light being sent through a transparency to a lens and mirror to be projected on a wall, light is collected by the mirror sent through a lens (in the cardboard tube) and then projected where the original transparency would be. 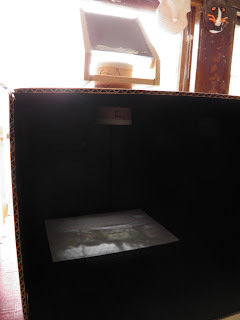 In order to make the projected image visible we added a box painted black inside under the mirror lens assembly to block ambient light in the room. 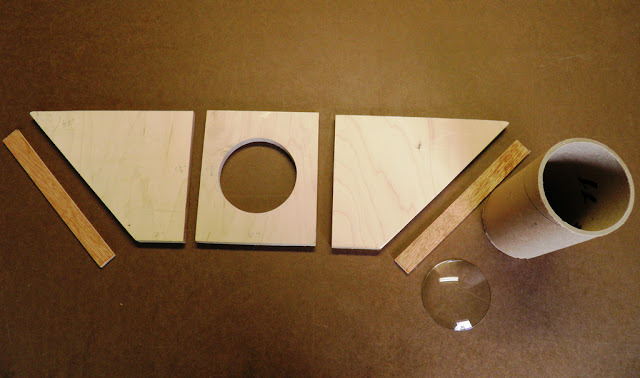 Here are the unassembled parts, the base plate is about 5 x 5 3/4'' with a 3 1/4'' hole (cut with a hole saw) in the center to accommodate the lens holder tube. 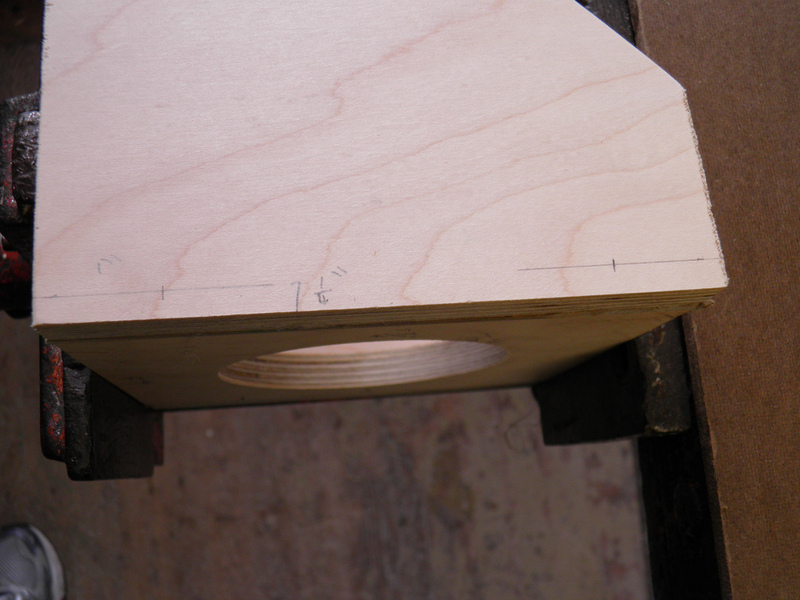 The mirror holder pieces are 5 3/4'' wide with a 45 degree angel cut made 2'' above the base. The large parts are 1/2'' plywood and the 2 pieces of 1/4'' ply will function as rails to hold the mirror and are about 1x7''. Early on we ran into one of the shortfalls of this design, as the mirror sits between the mirror holders, the base plate and mirror have to be cut straight and exactly the same width. As you can see we were a little off and had to hot glue some thick mat board on the side of the base plate to make up the difference. An easy way around this would be to simply get an oversized piece of mirror and glue it directly to the top of the mirror holders. 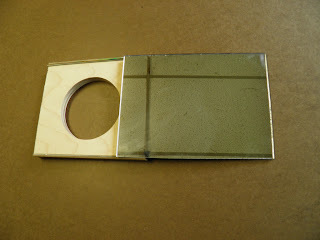 Alternatively you could eliminate the mirror holders all together and just add a hinge and another piece of wood and hold the mirror exactly like a overhead projector would. The down side of this is you would need a very stiff hinge or some way of holding the mirror at 45 degrees when the camera is in use. 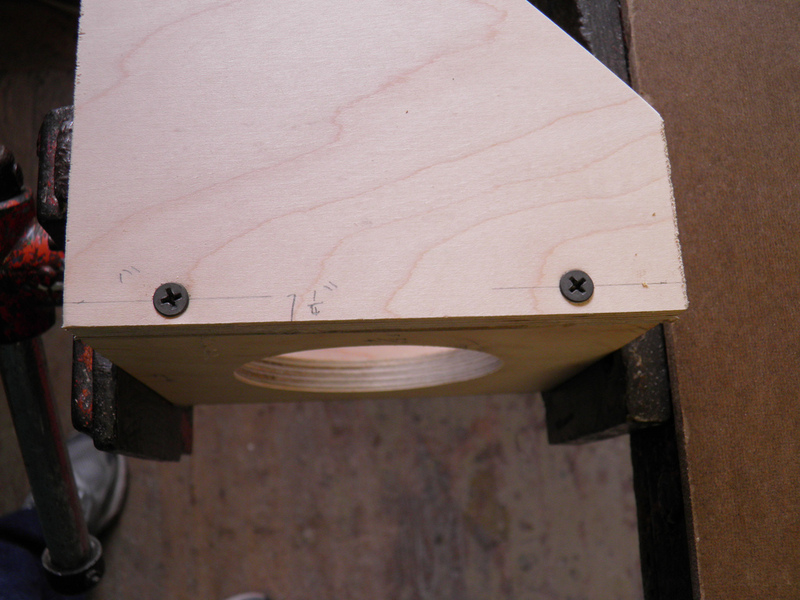 We went ahead and hot glued the sides on so we could mark and drill pilot holes (1'' in and 1/4'' up) for the screws that would provide the real structure. 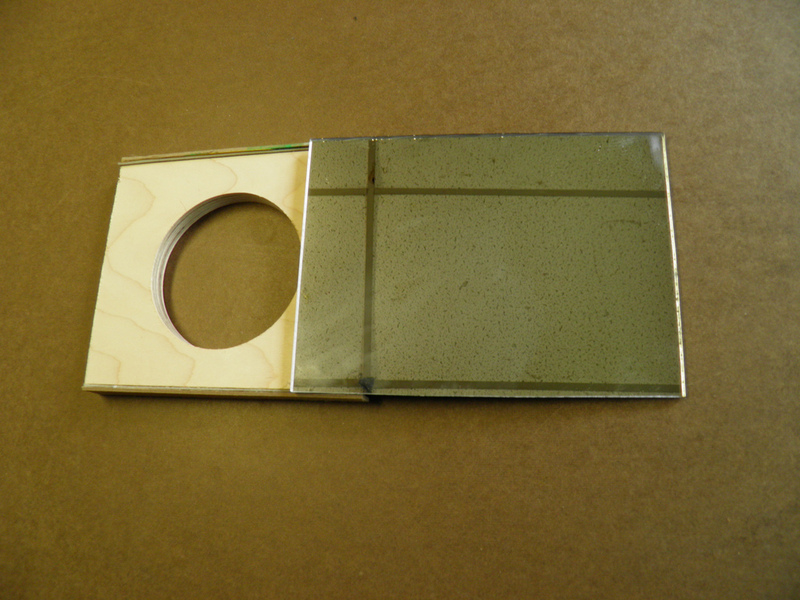 Here's the mirror secured with a couple of 1'' wood screws. Next we glued in the rails about 1/4'' from the top of the mirror holders diagonals, and generously glued the mirror on top of them. To assemble the lens holder tube we used the same technique as the cardboard telescope. 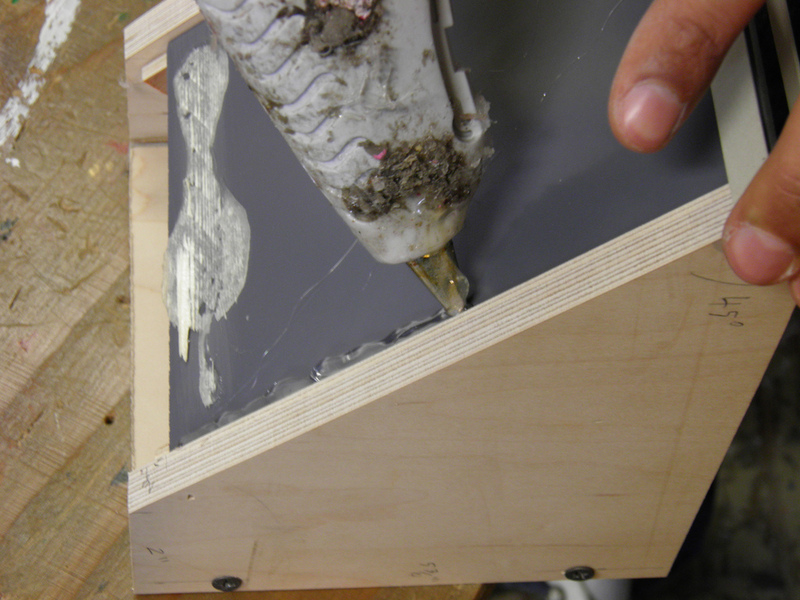 We cut 4 3/4''x3/4'' square pieces of foam core and glued them inside the tube using a 3/4''x1 3/4'' pieces of foam core to space them evenly from the lip of the tube. 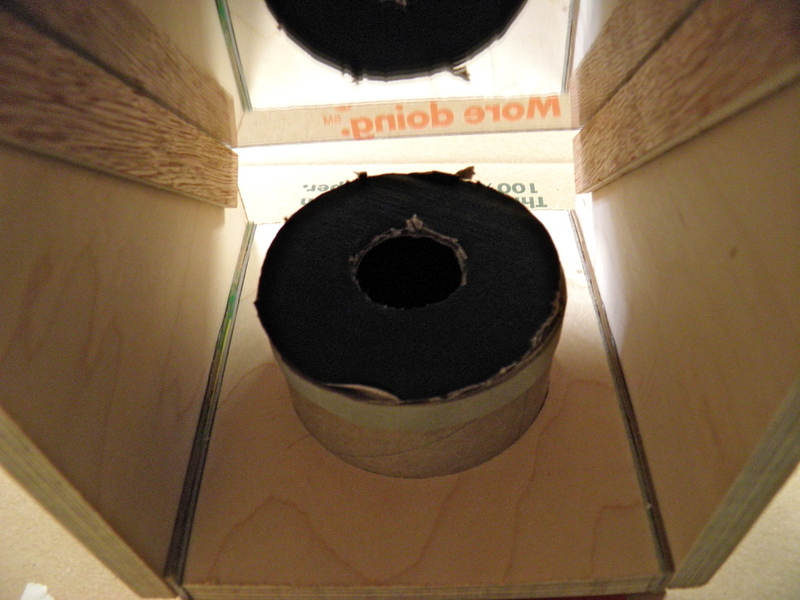 After the foam core squares were glued in we dropped in the lens and then glued the long spacers in over the lens to hold it in place. Optionally, you can paint the inside of the tube black before adding the lens as this might improve the image quality be preventing glare. 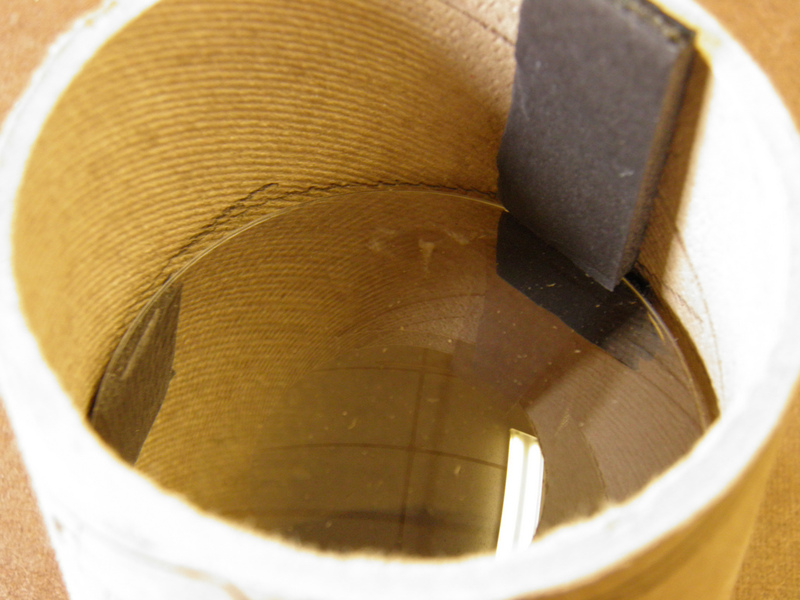 The finished lens mirror assembly looks like this. 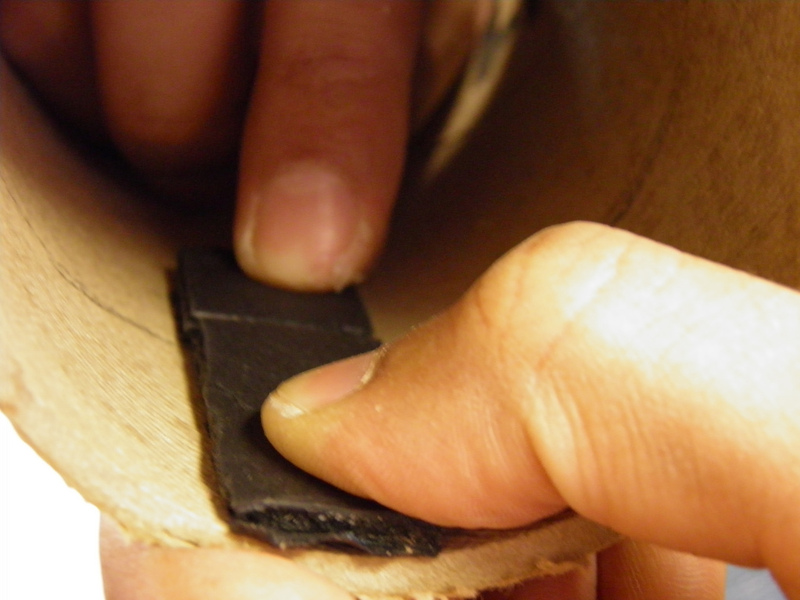 The cardboard tube has a pretty tight fit in our prototype, but we added a large rubber band just in case it loosened up with use. If your hole is a little over sized adding a larger rubber band directly above and below the base plate can help keep the lens holder in place while allowing it to move in order to focus the image while not letting it fall out. 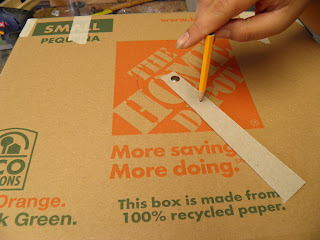 In order to prepare the box we drew a 3 1/4'' circle a few inches back from dead center on the side of the box (the top of the box is facing us) and cut it out with a utility knife. We added a piece of scrap mat board on the inside of the box and then painted the whole thing black to darken the projection area. By placing a piece of white paper in box under the lens mirror assembly you can get an image of whatever is in front of the camera. 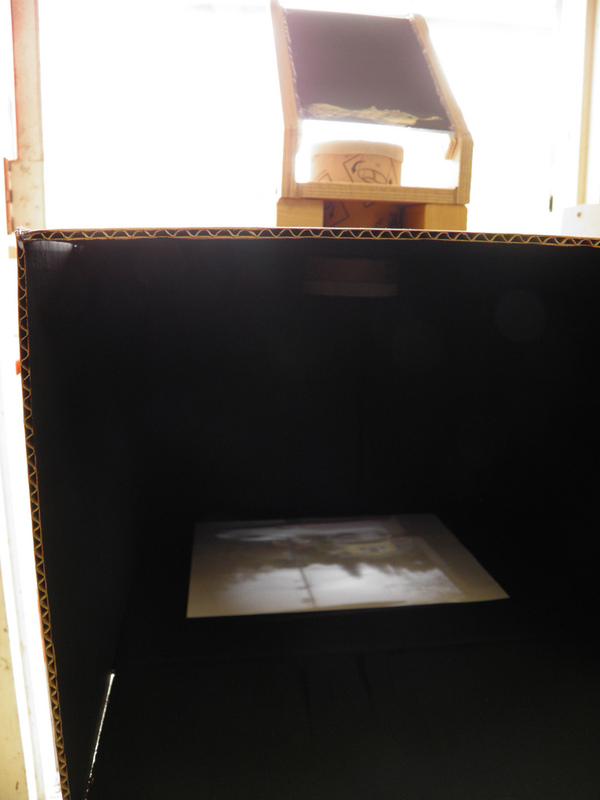 The unfolded lid of the box works to effectively protect the image from ambient light. 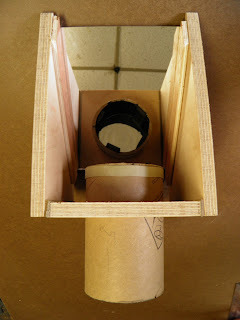 Fine focus can be achieved by moving the lens holder up and down in the base plate and course focus by propping up the whole assembly like we did here. Note that to get a right side up image you have to point the mirror lens assembly behind you, but for the purpose of drawing, observing this is not really necessary and may let too much light into the box. Here was the initial image quality achieved, legible, but not great. In order to improve it you need to add a aperture to restrict the amount of light that gets to the lens. While this makes the image dimmer it restricts light from passing through the edges of the lens which bends light at a slightly different rate than the middle making the image blurry. We ended up recycling the round piece of cardboard cut from the top of the box by cutting a hole about a third of the diameter in the middle and placing it on top of the lens holder tube below. 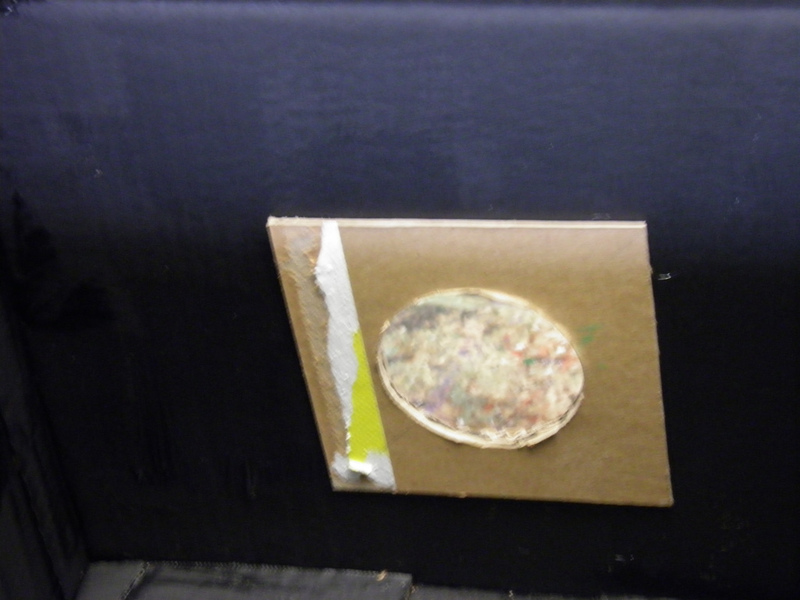 Even with a crudely cut hole the image quality is notably improved. For the best image quality there is an optimal aperture size and an optimal distance from the aperture to the lens, the "Dummy Camera" article on this page describes these ratios and has a few other useful diagrams for building a camera obscure. For this camera the optimal aperture size is somewhere between .75'' and 1''. 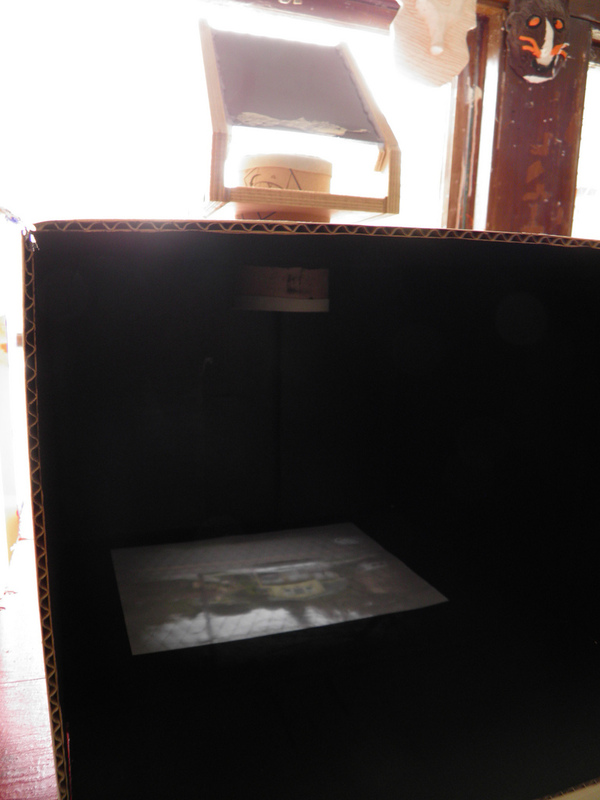 Check back in the future, in the spirit of the Camera projector we're planning to make another version of this which will hopefully function as an opaque projector.